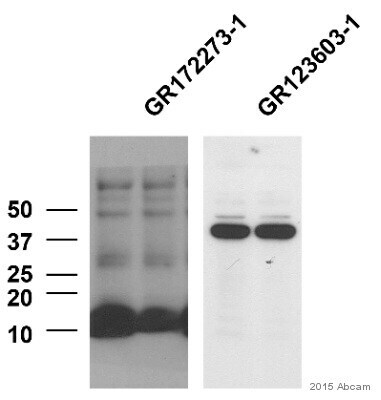 This antibody recognises beta and gamma actin in Human samples. It probably also recognises all the other known forms of Human actin. This antibody detects a single clean band in Human, Mouse, Rat, Chicken and Drosophila samples. In Xenopus laevis a secondary band is detected at about 30kDa. We are unsure whether this is cross-reaction with another actin isoform or merely non-specific. In Cow a doublet is detected, which probably represents different forms of actin. Synthetic peptide conjugated to KLH derived from within residues 350 to the C-terminus of Human Actin. Our Abpromise guarantee covers the use of ab1801 in the following tested applications. WB 1/1000. Detects a band of approximately 42 kDa (predicted molecular weight: 42 kDa). Block in 5% BSA. Blocking in milk significantly reduces the signal. 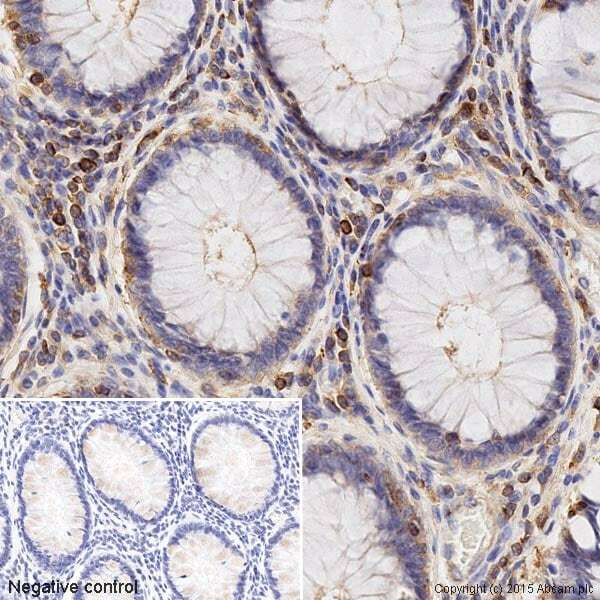 IHC image of ab1801 staining Actin in normal human colon formalin-fixed paraffin-embedded tissue sections*, performed on a Leica Bond. The section was pre-treated using heat mediated antigen retrieval with sodium citrate buffer (pH6, epitope retrieval solution 1) for 20 mins. The section was then incubated with ab1801, 5μl/ml concentration, for 15 mins at room temperature and detected using an HRP conjugated compact polymer system. DAB was used as the chromogen. The section was then counterstained with haematoxylin and mounted with DPX. No primary antibody was used in the negative control (shown on the inset). Western blot analysis of HeLa cells treated for 12 hours with hesperidin (h) (2.5 μg/ml, 4,01 μM), mangiferin (5 μg/ml, 11.84 μM) (m), and hesperidin (2.5 μg/ml, 4.01 μM) in a presence of mangiferin (5 μg/ml, 11.84 μM) (h+m). Immunoblotting was performed with the following primary antibodies: Bax (ab32503), BCL2 (ab59348), beta actin (ab1801), and caspase 8. After the washing steps, the membranes were incubated with goat anti-rabbit IgG (H+L) or with goat anti-mouse IgG (H+L) HRP-conjugated secondary antibodies and detected using ECL. Densitometry was performed using Image Lab software v. 4.1 (BioRad). Top panel: Following 12h of treatment of HeLa cells with hesperidin (h), mangiferin (m), and hesperidin in a presence of mangiferin (h+m), the mRNA levels were monitored in real - time PCR experiments. 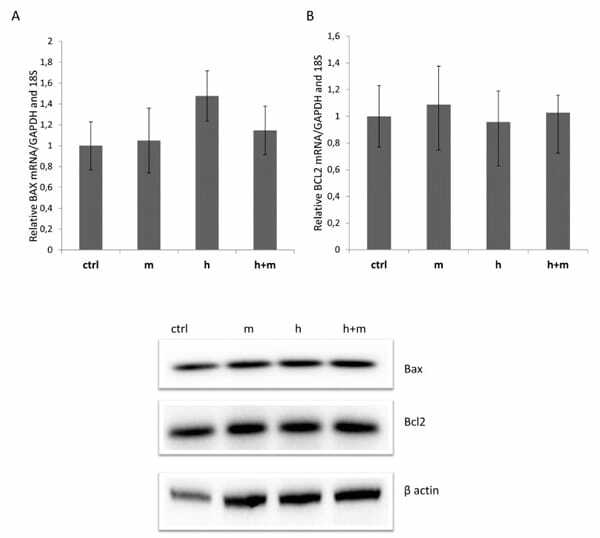 The BAX and BCL2 mRNA levels results from 2 independent experiments (n?=?8) are plotted relative to glyceraldehyde-3-phosphate dehydrogenase (GAPDH) and 18S rRNA levels and expressed as a fold change over the EtOH control. Error bars represent standard derivations. Bottom panel: Following 12h of treatment of HeLa cells with hesperidin (h), mangiferin (m), and hesperidin in a presence of mangiferin (h+m), the protein levels of Bax and BCL2 were detected with SDS-PAGE and Western Blot and related to beta actin levels. Publishing research using ab1801? Please let us know so that we can cite the reference in this datasheet. Sorry it has taken me so long to respond to your email. We have tested the antibody in HeLa cell and no actin bands were detected. We have used these cells previously in other experiments, so we expect them to work with the Western. We would greatly appreciate a refund for the product (ab1801). 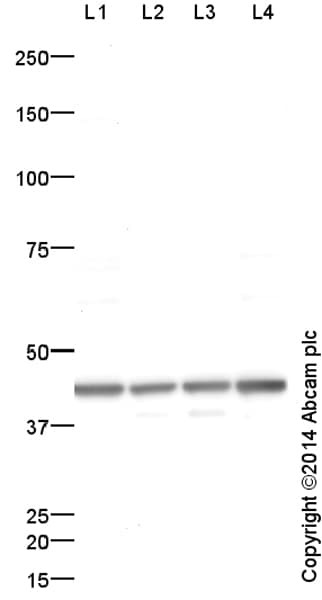 I am sorry that this antibody did not perform as stated on the datasheet. Since this order was paid for by credit card, the refund will go back onto the card. To avoid confusion, please ensure your accounts department is aware of how the credit note is being used. BSA and using a 1/1000 dilution. We have tried not only BSA, but 5% milk (even though the instructions state that milk reduces the signal). We have also tried a 1/500 dilution for the antibody. We have checked that the protein has transferred well using PonceauS stain. We have tried the Western using different anti-actin antibody as a control and have been able to detect actin. We have tried the Western with ab1801 several times with no luck. Do you have other suggestions for the antibody? Would it be possible to get a refund or replacement for this antibody? It is quite frustrating to do a Western blot where the experiment seems to be working, but our results are inconclusive because our actin control is not working. Thank you for taking time to contact us. I am sorry to hear this antibody is not providing satisfactory results. The details provided will enable us to investigate this case and will provide us with vital information for monitoring product quality. I appreciate the time you have spent in the laboratory and understand your concerns. It is regrettable the results have not been successful. Could I just ask to confirm the species that your samples were from (i.e. mouse)? As long as the antibody was being used in a tested species, I would be happy to offer you a replacment or refund. Please let me know which you would prefer. I am sorry this product did not perform as stated on the datasheet and for the inconvenience this has caused. As requested, I have issued a free of charge replacement for one vial of ab8227. Last month I order Anti-Actin antibody - Loading Control (ab1801) from your company. I ran the western blot assays with this antibody (rabbit, 1:1000) and used anti-rabbit secondary antibody (1:1000), but I get the white bands of actin (light black background)and dark black bands of molecular markersin the X-tay films. At the same time, I use the anti-tubulin (cell signaling) with the same procedures andget the normal balck bands oftubulinin the X-ray films. It sounds like you're seeing "inverse banding" which is white bands on a black background. Usually this means that you're using too much primary and/or secondary antibody. I'd recommend diluting the primary to 1:2000 and incubating this overnight at 4C in the blocking buffer (5% BSA) and using the secondary at 1:5000 - 10,000 for 1 hr at RT in blocking buffer. A 1:1000 dilution for a secondary antibody is quite high. Are you blocking in 5% BSA? How much protein are you loading and what are your samples (species, cell line, etc.)? Do you have an image that you can send? I would strongly recommend that you try diluting the primary and secondary more. Should the suggestions not improve the results, please do let me know. Could you please provide us a testing code for ab121733? I do hope that this antibody will work well with zebrafish, but if you need any assitance optimizing the protocol or anything else, please let me know and I'll be happy to help. The testing codes can actuallybe used to receive any primary antibody in our catalog, regardless of target. So, if the WDR81 antibody does not work with zebrafish samples, you can use the code to get any other primary antibody of your choosing. I hope that this information will be useful, but please let me know if you have further questions. Have a nice day! antibody. We have started ordering process with Kimera. It reacts with human samples. similarity sufficient to try this product on zebrafish? The immunogen is only 46% identical to the zebrafish sequence, but there are a couple of areas of high homology, so it's hard to say whether this antibody might react with zebrafish or not. My guess is that the antibody will weakly cross-react, but you may need to use a higher concentration to see a signal. We unfortunately don't have any other WDR81 antibodies to compare it to. If you would like a discount code to try this antibody, please let me know and I will send one to you. I hope that this helps! Have a great weekend and I look forward to hearing from you soon.